I’m only thirty-two years old, so maybe you can understand why I am so offended by my gray hairs. I look around at my contemporaries, a sea of blondes, brunettes, and red heads, all of whom seem to have not a hint of silver in their luxurious tresses. And then I look at my hair, which used to be a warm, sunny brown and is turning more mousy and dull by the day. I had always thought I would age gracefully, but as my ratio of browns to grays changed, I knew I needed to make a change, too. 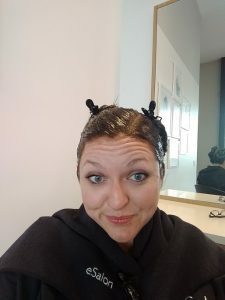 I didn’t want expense and time commitment of a salon visit every six weeks, and I found myself terrified at the prospect of figuring out how to dye my hair at home. I needed professional advice, like, yesterday. So imagine my excitement when I found a company who felt my pain, and were ready to help me through it, one step at a time. You might have seen ads on the internet for a company called eSalon, which boasts of “award winning hair color, made just for you.” And ladies? It does NOT disappoint. 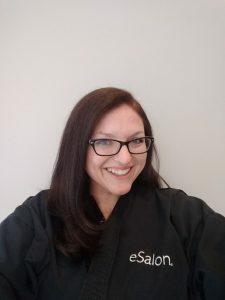 A big thank you to eSalon for sponsoring this post. 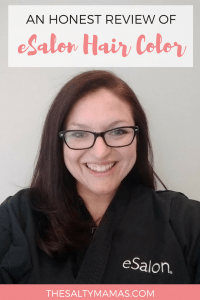 We reached out to eSalon, and they provided an in-studio hair coloring experience for Jaymi so that she could share her findings with you. As always, the thoughts, experiences, and opinions expressed here are our own. 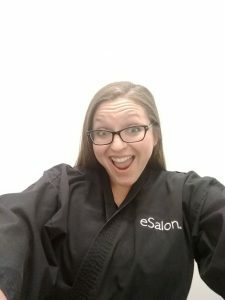 This is an honest eSalon review- scout’s honor! eSalon is a company that custom-produces hair color according to your preferences. You start with an online questionnaire that asks for your hair color, previous color experiences, and the shade you are hoping to achieve. Your profile is then reviewed by a professional colorist, who will look at the information you provided, contact you with further questions and concerns, and then create a custom color mixture just for you. If you live in Southern California, you can even head to their salon in El Segundo for a professional coloring experience, where they will give you a full tutorial on how to achieve salon-quality results at home. It does cost a bit more than a traditional box mix (about $30 per at-home treatment), but it is nowhere near the cost of heading to the hairdresser every six weeks. To me it feels like a fantastic, middle-of-the-road solution. 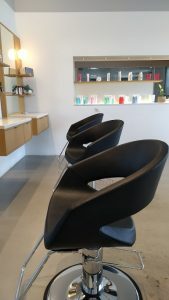 Since I’m a SoCal girl, I headed to the eSalon studio to receive my treatment. They have the entire company housed in one place- from manufacturing to marketing- so the whole company is available to serve you at any time. I got a quick tour of the production line, where I watched them custom create and fill bottles of eSalon hair color, and was able to see the boxes they were putting together for shipment. eSalon also carries a full line of hair care products, so you can choose what products you’d like included in your hair dye shipments (and the packaging is adorable- a little bit of happy mail for sure!). I arrived in the studio nervous, excited, and very sure of what I wanted. I wanted a permanent dye, one shade darker than my usual color. I wanted it to cover up all the grays for as long as humanly possible. All I can say, is thank God for my colorist, because NO. Together, we filled out my profile. Since I have what is known as virgin hair, my colorist suggested I use their demi color (read: semi-permanent) so that A.) I wouldn’t be as devastated if the color wasn’t quite what I’d had in mind and B.) because it would likely be all that was necessary to achieve results and C.) so that the color would fade over time, not leaving that severe straight-edge root look as it grew out. And I argued with him. Kind of a lot. But finally I decided he was the professional, so I would go with his advice. And then I wanted to go dark. Like, super dark. And with all the skill and restraint his training has accorded him, he proceeded to talk me down from that disaster waiting to happen. He took into account my skin tone, and my original hair color, and how the grays on my head might take to the dye. Although I was there to talk to him in person, he showed me how this same process can be complete online by submitting multiple pictures, and even talking with a colorist on the phone if needed. He said he was willing to do whatever I wanted, but in his professional opinion, I should go a shade lighter than I had planned. And ladies? I am so glad I did. The process of getting my hair dyed was luxurious in and of itself. I don’t know the last time I’ve taken an hour to myself to do anything, let alone sit in a quiet place where I was being pampered and beautified, while being offered large quantities of coffee. It was heaven, to put it mildly, but also very informative. 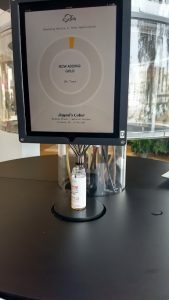 I asked lots of nosy questions, and watched the process carefully, so that when the time six weeks down the line, I would be able to apply my own color without fear. After a super glamourous blowout (which I can assure you left me looking far better than I have since probably my senior prom), I was able to put my old-lady glasses back on and finally take in my new color. And if I’m gonna be totally honest with you, gals? I was a little shocked. The color was a little darker than I had expected, and it felt like a marked change from my hair color before. (Although now that I’m looking at the pictures, it doesn’t seem as different as I thought. But hey, that’s what change does to a person.) Not to say I didn’t like it, but I had this moment where I was like- “WHOA. THAT HAPPENED.” And in the interest of full transparency, it kind of freaked me out. And also- that was the moment I decided I was going to be an eSalon customer for life. Because not only was the process affordable, easy, and personal, but it is fully customizable. If I had gone to the store and picked out a box of color for myself, I can tell you exactly what would have happened. I would be stuck with one shade darker UNTIL MY HAIR GREW OUT. And then as it grew out, I would try to go one shade lighter, which would inevitably have been one shade TOO light, and the color would take differently in the parts that had been colored before, and I’d end up spending a million dollars(ish) to get a hairdresser to fix my drastic (and permanent!) mistake. But instead? I took a beat. I thought, “ooh, that’s a bit dark. Thank goodness he talked me into demi instead of permanent. It’ll fade a bit over time. And next time I’ll have them add more gold.” Because it’s a custom color, and I can call them on the phone, and be like, “hey y’all, that was a little dark and red for me, can we go just a touch more blonde?” And they can not only do that, but they can send it to my house in a pretty pink package, and I’ll know exactly how to put it on. Well maybe not EXACTLY, but you know what I mean. 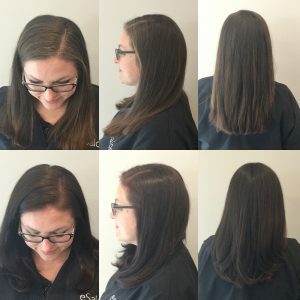 So if I had it to do all over again, would I choose to use eSalon? You bet your bottom dollar I would, and I can honestly suggest you do the same. If you’re in Southern California, you can sign up for an in-studio appointment here. And if you’re not- you’re not gonna believe this- you can get $10 off your first shipment of hair color. Say goodbye to grays, and hello to eSalon hair color- cause I think you’re gonna love it as much as I did. That’s really cool that you got to try it in the salon! And I like the color ? Thanks! I really do now, too. The colorist was basically a psychic…he’s like, “yeah, we’re gonna go demi so you don’t cry.” First time hair color problems, I guess! But will they match my very natural hair color of purple and blue? That sounds amazing! I’m still on the fence about covering my few grays. . . Mostly because I’m lazy and never make appointments to get my hair done. So this sounds perfect!